After more than 20 years writing smash hits about smashing the state, ANTI-FLAG have complied a comprehensive best of album. 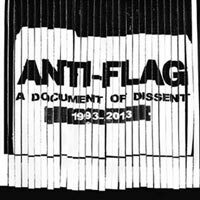 Aptly titled A Document of Dissent, this collection houses two decades of material that thoroughly represents ANTI-FLAG’s strong blend of music and message. Originally aimed at toppling oppression, it wasn’t long before ANTI-FLAG’s songs were topping the charts. Eventually ANTI-FLAG landed as the premiere political punk band around with an unparalleled ability to write high-energy, riffy, fist-pumping, sing-along anthems that never lose sight of the band’s anti-war, anti-imperialism, pro-human rights ethos. Comprised of 26 tracks, culled from 9 full-length albums spanning 6 labels, A Document of Dissent showcases the evolution of the band’s sound with hit after glorious hit, each accompanied by in-depth liners notes from the band illustrating the songs’ history and significance. In addition, the packaging includes a biographical timeline of the band cross-referenced with world events. A Document of Dissent is the quintessential ANTI-FLAG collection for diehard and casual fans alike.